On the upside, the same Ipsos poll ranked Redford as the most premier like. How did the debate affect your thoughts on each leader? 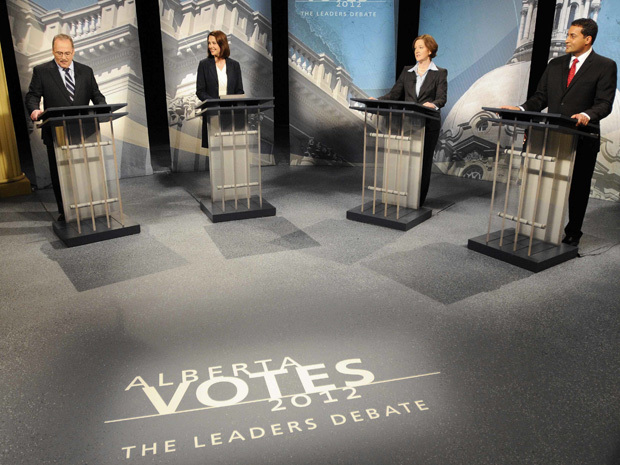 In last year’s federal election debate polls didn’t show Layton winning the debate, but there was a big improvement in their impression of him as a leader. And the rest was history. Same thing for Mason here. 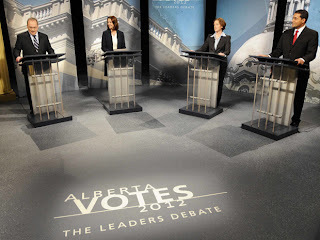 By Lou Arab, at 12:43 p.m.
Lou, if you're suggesting Mason will win Alberta based on last night's debate performance, kindly get in touch with reality. Layton "won" off the debate because he contrasted himself as better than Iggy. Mason definitely showed himself as a seasoned debater, but he's not going to sweep Quebec. Because there is no Quebec in this case. The race is polarized between two conservatives, Mason will be lucky if NDP voters don't abandon his party to try and keep out the Wildrosers. By Volkov, at 1:39 p.m.
You're right about Layton not being declared the winner, but he was ahead of Ignatieff on that score. I'm skeptical we'll see any kind of orange wave here, but you never know. By calgarygrit, at 1:41 p.m.
Baron Danni's "we don't serve your colour here" law for the conscientious will receive heavy play soon. You want to work for the government? You do the job. Why does Danni want to make it easier for those she generally despises, those paid by the government. By liberal supporter, at 9:44 p.m.